North Dakota lawmakers have fought for more than a decade now over the use of the University ‘s Fighting Sioux name and logo. In 1999 legislators introduced a bill to eliminate the nickname, but it never passed. Then in 2001 Ralph Engelstad donated $100 million for a new hockey arena conditioned on the indefinite use of the Fighting Sioux name. The NCAA complicated matters in 2005, however, when it banned all use of Native American mascots unless schools received approval from the respective tribes. The North Dakota Board of Higher Education then approved a motion to retire the Fighting Sioux nickname and logo in 2009. But the confusion didn’t end. In March of 2011 the governor signed a law prohibiting the University from getting rid of the nickname and logo only to see that bill overturned. Now supporters of the Fighting Sioux name gathered enough signatures to put the matter to a statewide vote this coming June only to then lead to a lawsuit by the Board of Higher Education against the Secretary of State to block that vote. In the midst of this headache-causing confusion is the base line question of who owns the trademark in the Fighting Sioux name and logo, and what happens to the trademark if the name is banned from use? To answer these questions we went straight to Grand Forks to gain the expert advice of Prof. Eric E. Johnson. Prof. Johnson, a Harvard Law graduate and Affiliate Scholar at the Stanford Law School Center for Internet and Society, teaches Torts, Intellectual Property, Media & Entertainment Law, Sports Law, and Antitrust, Bankruptcy & Consumer Law at the University of North Dakota School of Law. He also authors two blogs: Blog Law Blog, which covers the legal aspects of blogging and Pixelization, which mostly concerns intellectual property and entertainment law. Prof. Johnson’s views are his own, not representative of the University of North Dakota. Copyright law and trademark law really have absolutely nothing in common. Copyright is a form of limited term monopoly rights in an artistic work: a book, a movie, a screenplay, a photograph, a work of choreography. That is protected for a limited time for about 100 years where the author gets exclusive rights to that which they can license to other people. Basically they can sue other people who copy their work. Trademark law grew out of torts and is similar in its origin to defamation law. The idea of trademark law is that you have a certain identity in the business world and commerce and if someone else uses a similar name, symbol, or slogan to you — and if that would cause consumers to likely to be confused as to who is selling that product — then you have a claim for trademark infringement. So the fact that they have both come to be called intellectual property can cause you to think they have some similarities but they have completely different origins, theories and they are intended to protect different things. Which one are we dealing with in terms of athletic team names, logos and nicknames? When it comes to sports and sports merchandising, there really never has been an intellectual property right to protect sports merchandise and that is why sports organizers – team owners – have tried to cobble together theories of intellectual property to have a monopoly over sports rights. When I was a kid in the 70s and we would go to the ball park. When you walked to the ballpark you would go past several people selling shirts and hats that was unlicensed merchandise. It was kind of cheap and wasn’t as good as the official merchandise inside the stadium, but there was nothing illegal about selling it. Police wouldn’t arrest them and nobody would pursue a claim against them. It was just the cheap stuff and if you wanted the expensive, official team merchandise you’d get it inside the stadium. The whole phrase “official team merchandise” doesn’t really exist anymore, because now there is no such thing as unofficial team merchandise. Back in the 70s it was official team merchandise and then just regular merchandise. Around the 70s in the seminal case Boston Professional Hockey vs. Dallas Cap and Emblem (510 F.2d 1004), the team owners began claiming that people who put team names and team logos on shirts or hats were infringing the team’s trademark. Now this is a strange theory when you look at trademark law because the idea of trademark law is to prevent consumer confusion. So the first thing you have to ask yourself is what line of business is a sports team in? They are in the business of putting on sporting contests and fielding a team. So the question is, what kind of trademark interest do they have in the name, the Bruins? They have a trademark over the name Bruins for fielding a hockey team. So conceivably if someone else put a hockey team on the ice called the Bruins and that would cause people to be confused about which team they are watching, that would be a good trademark case. The trademark theory for the Boston Bruins controlling the t-shirt sales depends upon a theory that the Boston Bruins are in the t-shirt business so when a consumer is looking for a t-shirt to buy they see a Boston Bruins logo and the consumer would have to say “well I’ve always found Bruins shirts to be a good value in the past, so I need a new shirt and I’ll by a Bruins shirt because it will be a quality shirt.” Now that is absurd, nobody makes purchases of sports merchandise that way. Nonetheless in that case, the 5th Circuit went out of their way to stretch trademark law to allow the team owners to sue people making unauthorized, unofficial merchandise on the basis of trademark infringement and it has grown from there to becoming an industry and something the teams are ferociously protective over and police closely. The intellectual property interests that team owners, colleges and whatnot claim in their logans and names and nicknames is a trademark interest. It is very strained legal theory, but at this point it is stable because it has gone on for a long time and there is a lot of precedent. But that is the theory on which they protect these things – trademark. It is very strange theory in terms of trademark law, though. If the university stops using “Fighting Sioux” name and logo, does that mean anyone could start making Fighting Sioux shirts without fear of prosecution? That’s a good question. Because trademark is about some indication of the commercial source of some stream of goods or services for the consuming public to understand who they are dealing with, trademarks are capable of lasting forever. A copyright has to terminate at some point because the idea of a copyright is to encourage authors with a limited term monopoly right, similar to patents encouraging inventors. With trademarks, they are capable of indefinite duration, because it is not about encouraging creativity it is about giving consumers a stable indication of who they are doing business with. And that also means that once you stop using a mark, your trademark rights evaporate. You can’t maintain a trademark right on a mark you stopped using and don’t intend to use in the future. 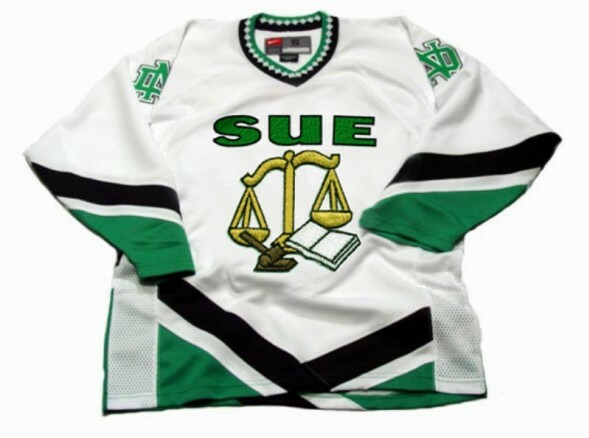 The North Dakota Supreme Court is poised to settle the controversy surrounding the Fighting Sioux logo. I would imagine that what the University of North Dakota would do and here I’m only guessing because I don’t speak for the university, but I imagine they would maintain the art of the Fighting Sioux in some way and continue to exploit it commercially in some ways to maintain trademark rights over it, because if they drop it completely then they leave it for someone else to pick up and start using to manufacture merchandise. It might be hard for the University of North Dakota to find a replacement for Fighting Sioux, so how do you protect a generic name like Wildcats? How do you examine two marks that are very similar like the interlocking ND logos between North Dakota and Notre Dame? The circuits generally have a multifactor test that is seven to nine factors that say you are supposed to compare the marks and look at the strengths of the mark, evidence of confusion by consumers, how expensive is the good or service on the theory that if it is cheap consumers will be confused more easily than if it is expensive. For example if you have packs of chewing gum with similar logos then because consumers will just grab gum and put it on the conveyor belt it is easy for them to get confused whereas if someone is buying a nuclear reactor it won’t be an impulse buy and they will know exactly which manufacturer they are dealing with. So there are all these different factors circuits look at. Now the Notre Dame mark is interesting because the interlocking N and D was first used by the University North Dakota. Notre Dame used it second but they were not in overlapping markets so that was allowable. This was back before people were selling merchandise all across the country like they do now. Notre Dame obtained the federal registration for the logo, though, and once you do that, the law presumes that you are using the mark nationwide even if you are not. You get credit nationwide in terms of stopping other people from using the mark. But if there is a senior user, a user of the mark who was there first, then they get to retain the use of their mark in their original marketplace. So theoretically you are not allowed to sell a Notre Dame ND shirt in North Dakota. Who owns a trademark? The team owner? For trademarks it is not who owns the team or the league. It is who is the commercial source behind the merchandise. This is actually a battle fought over some heritage memorabilia for defunct teams. Theoretically it doesn’t have to be anyone associated with the team, just whoever is making the merchandise. I seriously love your site.. Pleasant colors & theme. Did you create this web site yourself? Please reply back as I’m trying to create my own blog and want to learn where you got this from or just what the theme is named. Many thanks! Yes we did via wordpress with Yahoo hosting.